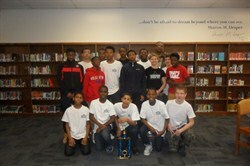 Memorial Boys Basketball Team Wins 7th Grade Championship! In an intensely waged contest of SEL’s 7th grade ‘cagers,’ the Memorial Junior High 7th grade basketball team claimed victory in the N.O.C. Conference Basketball Tournament in Hudson. The Boys Basketball team, lead by Coach Lamar Frost, finished the year with a record of 14-1. The SEL first place finishers earned the championship with a concentrated effort and win against cross-town rival, Shaker Heights, 39- 36. One observer suggested that such impassioned play matched the intensity demonstrated at actual high school contests. Congratulations to the Memorial Junior High 7th grade basketball team. With such spirited competitiveness, the Brush High School teams of the future have a great deal of potential!